CooksRecipes has quality, kitchen-tested recipes for ground beef pasta dishes that you can count on for successful deliciousness. 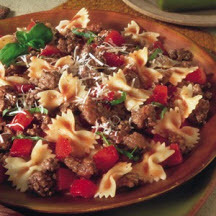 Add this ground beef and pasta recipe to your list of quick and easy meal ideas. 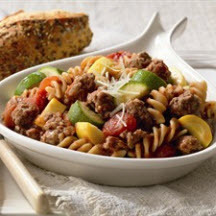 Lean ground beef, pasta and fresh vegetables come together in a quick and easy one-skillet meal. 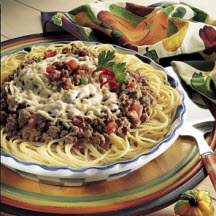 Two types of cheeses, Monterey Jack and cheddar, plus garlic, cumin and tomatoes with green chilies add a southwestern twist of flavor to this tasty ground beef spaghetti pie.